Groups are used to categorize your users. Each user can be assigned to a group which may be used to determine a users function within the company. Examples would be “Customer Service”, “Software Development”, Quality Assurance”, etc. Users can also be members of multiple groups – which is perfect for those wearing multiple hats! Ticket Notifications: When a ticket is created and assigned to a group, by default every member of the group is notified via email. Any individual who is part of a group may take ownership of a ticket at anytime. 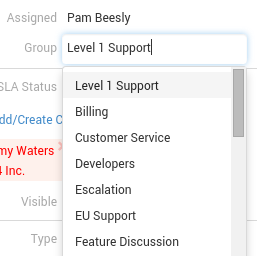 User Settings: Group Ticket emails can be turned off on a per user bases using the the “Receive Assigned Group Notifications” and “Receive Unassigned Group Notifications” in User Properties. SLA: If a Service Level Agreement is applied to a ticket, Group Notifications may be activated. Calendar: The Calendar feature allows you to indicate a Group assignment. Each Group contains a Calendar tab which allows you to see only events related to that particular Group. Watercooler: Each post to the Watercooler has a Group option which allows you to only send notifications to specified group(s) rather than all users. Tasks: Edition: Enterprise Only. The Tasks feature allows you to indicate a Group assignment. Default Group You may indicate a default Group that will be applied for new tickets from email and Customer Hub. For manually entered tickets (agent entry), if a user is a member of only one Group, that Group will be the default. If a user is not part of any Group or multiple Groups, the default Group setting will be “unassigned”. My Company Settings: You may set Company wide Group settings for Group requirements and Group/Ticket display settings. Ticket Automation: Ticket Automation is a powerful tool that will allow you to customize your account based on your business needs. Groups can be set automatically based on an array of factors including user assignment, keywords, Ticket Type selection, and many other conditions. Alternate Emails: If more than one email address is being sent into your system for ticket creation, these will be setup as Alternate Emails. Each Alternate Email has a default Group that can be assigned. Reporting and Metrics: Groups are also a common field to include in reports, especially those added to a Users Dashboard or Ticket View. Product Line: When you create a Group, you may specify a Product Line. Within the app, the Group will only be available on a ticket when a Product which is in the specified Product Line is selected on the ticket as well. Additionally, the “Product Line Filtering” setting controls whether or not a Group will be displayed when both Group and Customer Hub instance share a Product Line association. Customer Hub: Groups are (optionally) available for customers to select on tickets created on the Customer Hub. Additionally, the “Product Line Filtering” setting controls whether or not a Group will be displayed when both Group and Customer Hub instance share a Product Line association. Below is the view from a ticket showing the assigned group. Below is a view of the groups window. Name: This is the name that you gave this Group. The number in parenthesis next to the Group name indicates the number of open tickets in each group. Plus button (Add): This button adds a new Group to your account. Pencil button (Edit): Click the pencil button to edit the groups basic information. Trash button (Delete): You may delete a group by clicking the trash button. Group Information Tab: This tab contains the users which are members of the group. You may add and remove users from the group from this tab. Open Tab: Displays the open tickets in the selected group. Closed Tab: Displays the closed tickets in the selected group. Unassigned Tab: Displays the open tickets in the selected group which also have an “unassigned” user. All Tickets Tab: Displays the open tickets in the selected group regardless of open/closed status. History Tab: Activities in TeamSupport which are related to the selected group will be displayed in the History Tab. This tab is only available to Admins. 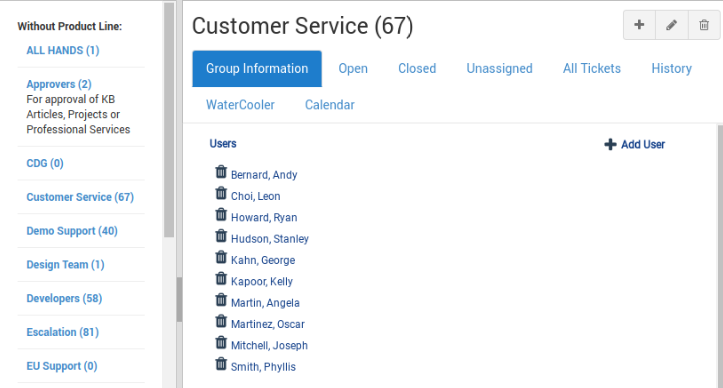 Watercooler Tab: If a group was associated to a Watercooler post, the post will show up on the this tab under the appropriate group. Calendar Tab: If a group was associated to a Calendar event, the event will show up on the this tab under the appropriate group.